…some call me a werewolf of loooove. When I get bad jokes or bad writing in my head, I get it out. But I don’t get it out and delete it, nope, I share it with y’all. This is yet another horror comic recommendation, and FYI, I am totally going to cheaply re-use these in October to get more traffic and whatnot. 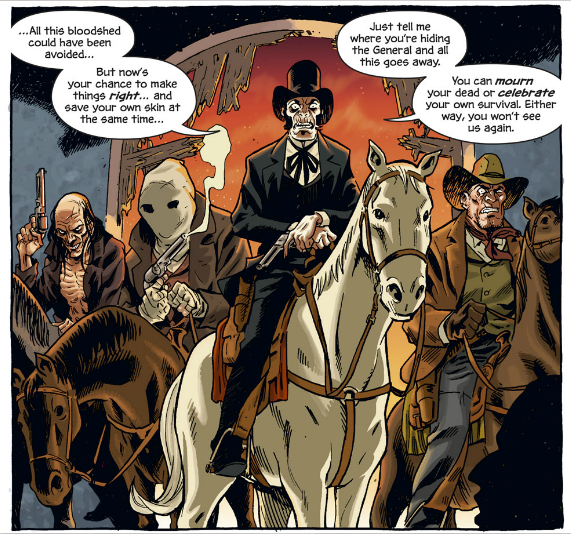 This comic, like American Vampire, falls into a category of “horror western.” Written by Cullen Bunn with art by Brian Hurtt, this is The Sixth Gun. That’s Drake Sinclair. Our resident mysterious gunslinger leaving a Pinkerton to die. Pinkertons were the worst. They were a ‘detective agency,’ but they were really hired guns selling their services to the highest bidder. You’ll find in this series and in the excellent HBO drama Deadwood that they were indeed the worst. Pinkertons were the worst. I cannot state this enough. Though I should do some reading to find out if in fact these fictional stories are correct in their assessment, I do find comfort in assuming that strike-breaking, undead general aiding goons were the worst. Yup, I said “undead general.” That’s our villain. General Olliander Hume. An evil Confederate general with an evil gang and six evil guns that each have their own unique power and are bound to their owners for life. So we’ve met Drake Sinclair. Here’s Becky. 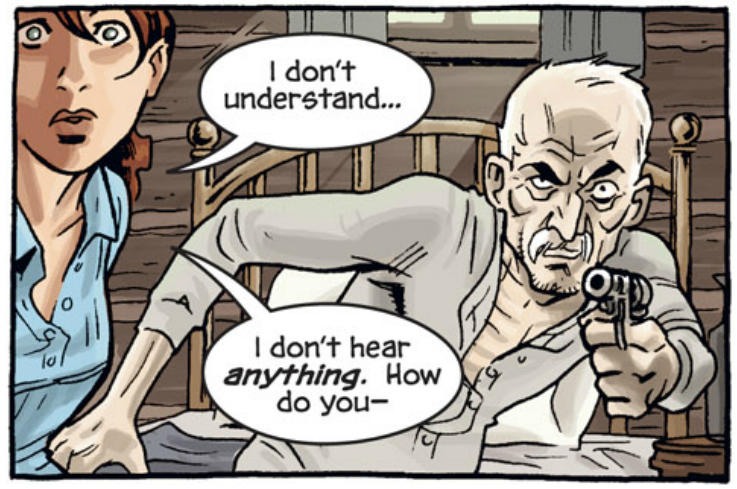 A bunch of lousy, no good Pinkertons come after her father, and through some shenanigans that I won’t spoil, leave Becky with a dead father and a magic gun. OK, I kinda spoiled things. But I didn’t tell you how the Pinkertons shot her father in the head. Oh. Crap. And here’s General Hume’s evil gang of ghouls. I can’t say that they’re all ghouls in the strict definition of the term, but gang of ghouls sounds great, so hey, I’m going with it. 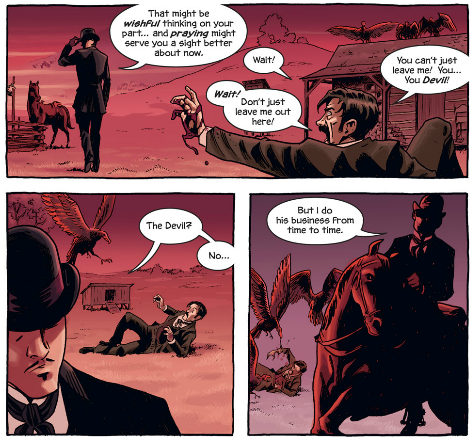 I’m barely touching on what makes The Sixth Gun such an enjoyable comic. Bunn’s story moves at a quick (and funny!) pace, constantly introducing characters and building a rich, rich mythology. The book feels like a classic western film, but doesn’t feel constrained by those trappings. Hurtt’s art has a loose, lightly inked feel. His eyes are amazingly expressive yet cartoony. Working together, the two come up with a spectacular book. I’ve read issues 1-6 of this series, and plan to read more. Before I get into where to buy and all that, I want to note something. When I got back into comics in late high school, after a brief hiatus where I thought reading comics was responsible for my lack of success with the ladies, I was introduced to some comics that were different than what I had read before. The art was better. There weren’t any thought bubbles. Comics kind of looked like movies. And that was what was being marketed. A “Widescreen” approach. But widescreen seemed to be the main takeaway that the comic marketers and press had from film. Well, there’s more to film, and more to storytelling than aspect ratio. Look at that page. That is brilliant editing and brilliant storytelling. If you’re going to compare a still image on the page to a moving image…well….that’s a moving image on a still page. I don’t know if that makes much sense, but goddamn it’s good comics. It doesn’t need me to tell you how good it is (Though I guess it does, since you’re not reading it). 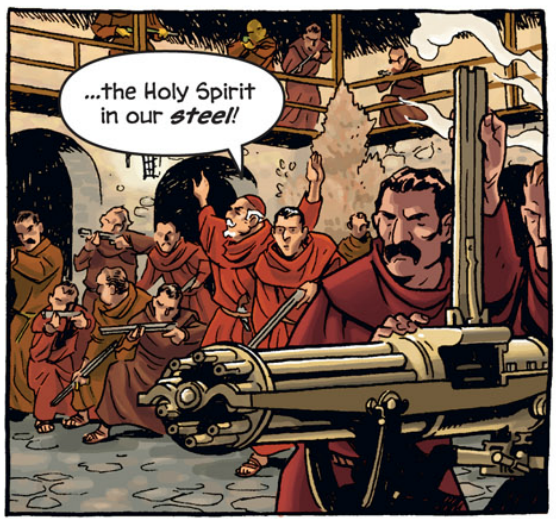 Anyway, you can be like me, and buy The Sixth Gun on Comixology. It’s $8.99 for six issues. That is amazing. 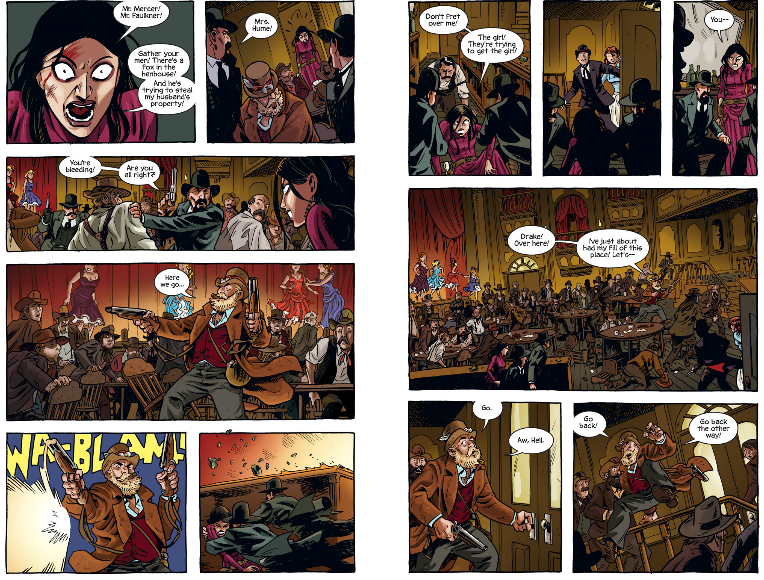 You can also go to your local comic store or book store and pick it up in print, or buy it on Amazon.